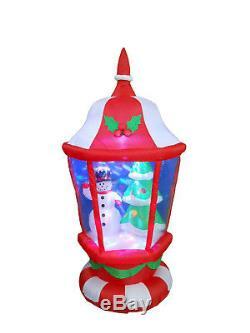 6 Foot Tall Lighted Christmas Inflatable Lantern with Snowman and Christmas Tree. Everything included: Inflatable, Fan, Ground Stakes and Tethers. With self-inflating air blown design, the inflatable will be presented in front of your family in seconds. It is the perfect holiday yard decoration. Inflated Size: 36" x 36" x 72 (L x W x H). Lights up for better nighttime viewing. Self inflates in moment and lights up when plugs into a standard electrical outlet. Stakes, tethers and blower included for quick and easy setup. Deflates back down for easy compact storage. Good for indoor and outdoor use. Your satisfaction is our priority! Within the Lower 48 states! All package s are sent via. Please be noted that, this service is more recommended for Monday-Thursday orders. We value you as a customer and your complete satisfaction is our goal. If for any reason you feel you cannot leave us the highest 5-Star feedback in every category, please let us know prior to leaving feedback and we will do our best to rectify any problem to your satisfaction. The item "6 Foot Christmas LED Inflatable Lantern Snowman & X'mas tree Outdoor Decoration" is in sale since Wednesday, October 11, 2017. This item is in the category "Collectibles\Holiday & Seasonal\Christmas\ Current (1991-Now)\Yard Décor". The seller is "365_promogifts" and is located in USA. This item can be shipped to United States, Canada, Denmark, Romania, Slovakia, Bulgaria, Czech republic, Finland, Hungary, Latvia, Lithuania, Malta, Estonia, Australia, Greece, Portugal, Cyprus, Slovenia, Japan, China, Sweden, South Korea, Indonesia, Taiwan, South africa, Thailand, Belgium, France, Hong Kong, Ireland, Netherlands, Poland, Spain, Italy, Germany, Austria, Israel, Mexico, New Zealand, Philippines, Singapore, Switzerland, Norway, Saudi arabia, Ukraine, United arab emirates, Qatar, Kuwait, Bahrain, Croatia, Malaysia, Brazil, Chile, Colombia, Costa rica, Dominican republic, Panama, Trinidad and tobago, Guatemala, El salvador, Honduras, Jamaica, Antigua and barbuda, Aruba, Belize, Dominica, Grenada, Saint kitts and nevis, Saint lucia, Montserrat, Turks and caicos islands, Barbados, Bangladesh, Bermuda, Brunei darussalam, Bolivia, Ecuador, Egypt, French guiana, Guernsey, Gibraltar, Guadeloupe, Iceland, Jersey, Jordan, Cambodia, Cayman islands, Liechtenstein, Sri lanka, Luxembourg, Monaco, Macao, Martinique, Maldives, Nicaragua, Oman, Peru, Pakistan, Paraguay, Reunion.